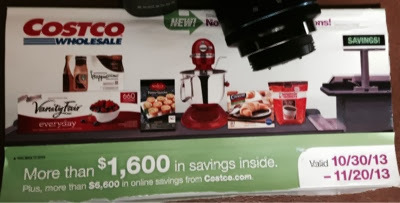 Kimberly at Addicted to Costco has again posted a .pdf of the new Costco coupon book, composed of coupons that are good from October 30 to November 20, 2013. She's been moving but has settled into her apartment in London, so she'll be posting more regularly now. I was astounded by one of the coupons. I've been posting here about trying to decide on a camera and maybe wanting the new Samsung mirrorless camera rather than a more old-fashioned DSLR. Well, last week, I finally decided and actually purchased my new Samsung from Costco.